Deputies from Harris County Sheriffs Office, Department of Public Safety, Precinct 3 Constables office, a Houston Police Dept. 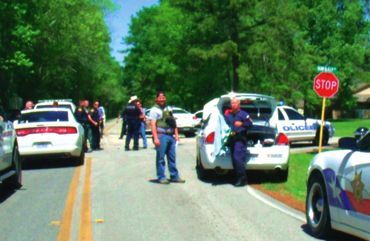 officer and an outside agency searched Dallas Road at Gum Gully from 11:00 a.m. until 1:22 p.m. with helicopter and dogs, on March 24. A resident in the neighborhood said law enforcement were looking for a guy that had killed somebody and knew the woods like the back of his hand. Another resident indicated he had seen a man in a ditch get up with his hands up when the dog came up on him. Neighter the Sheriffs Office, Precinct 3, D.P.S. or F.B.I could say what the outside agency was searching for as of Tuesday. The Sheriffs office stated, I dont know if anyone was taken into custody in the incident. in contrast to what residents said. EAST HARRIS COUNTY  An unusual head-on crash of two motorcycles took the life of one of the drivers, and severly injured the other, according to the Harris County Sheriffs office. The collision happened Saturday, March 26 at about 4:00 p.m. on FM1942 at Barbers Hill Road. Investigators said that apparently the Yamaha motorcycle, headed westbound on FM1942 crossed over to the other lane on the two lane road, striking a Harley Davidson head on. This ocurred at a bend in the road, near Barbers Hill Road. The Harley Davidson cycle was headed eastbound. The driver of that bike died at the scene, according to emergency personnel. The Yamaha slid on its side into oncoming traffic, and that driver was seriously injured. He was LifeFlighted to the hospital.